Interstate Removalist Hervey Bay – Moving to or from Hervey Bay? We’ve got you covered. If you’re looking for a Hervey Bay Removalist you can’t go past 1800 Removals. We quote our Hervey Bay removalist to include two men for your local removal, however you can always hire an extra removalist to get the job done faster. 1800 removals can help your with your removal of a unit or 2 bedroom houses with a small truck, 3-4 for bedroom house with the medium sized trucks or a large 5+ bedroom home with the large trucks. Otherwise at a cheaper rate we can supply just one man and small truck. Hervey Bay is a city in the state of Queensland, Australia. The city is situated approximately 290 kilometres (180 mi) or 3½ hours’ highway drive north of the state capital, Brisbane. It is a natural bay between the Queensland mainland and nearby Fraser Island. The local economy relies on tourism which is based primarily around whale watching in Platypus Bay to the North, access to Fraser Island, accessible recreational fishing and boating and the natural north facing, calm beaches with wide undeveloped foreshore zones. At the 2011 Australian Census the city recorded a population of 48,680. Hervey Bay is an area of high population growth. It has a median age of 45, significantly higher than the national average of 37. Hervey Bay is the whale watching capital of Australia, with humpback whales migrating along the coast between April and October every year. Researchers at the Oceania Project conducted a 14-year study which found the bay was an important social hub for humpback whales. Whale number have increased from about 2,000 in 1992, to around 7,000 in 2005. Hervey Bay is the resting place for Humpback whales, Mum’s and Calves, they come to the Bay to rest and build up energy for their long travels back to Antarctica. The Adults come to play, socialise and there have been heat runs observed in the Bay. The Humpback Whales are known to be very relaxed in the company of the whale watching vessels. The indigenous Butchulla people are the traditional residents of Hervey Bay. The first recorded European sighting of Hervey Bay was made by James Cook while carrying out his running survey of the east coast of Australia, on the 22 May 1770. “By noon Cook’s ship was in a position a little over half-way across the opening of Hervey Bay heading for Bundaberg. When Cook first discovered Hervey Bay, he did not realize that Fraser Island was separated from mainland Australia; Cook did not travel far enough south due to the shallow depths of the waters in the Bay. Cook named the bay “Hervey’s Bay” after Augustus John Hervey (1724–1779), later Third Earl of Bristol, a naval officer who became a Lord of the Admiralty the year Endeavour returned”. Hervey Bay has 14 schools. Hervey Bay also has two Higher Education institutes, a campus of the University of Southern Queensland and the Wide Bay Institute of TAFE. and a State Government Special School. Hervey Bay is situated approximately 3½ hours’ drive north of Brisbane, via the Bruce Highway and 30 minutes’ drive north-east of Maryborough. The city is also served by the high-speed Tilt Train, which has connections from Maryborough West or nearby Howard. The city is served by the Hervey Bay Airport, with direct flights from Brisbane (QantasLink) and Sydney (Virgin Australia). The City of Hervey Bay (now the Fraser Coast Region) has released an airport master plan which includes future provision of a taxiway parallel to the main runway, additional car parking and a larger terminal. The city is also served by passenger ferry to Fraser Island, as well as both scheduled and unscheduled vehicular ferries. Despite Hervey Bay’s growing popularity, no plans have been made for a new railway line to the city. The previous passenger and freight line branched off the North Coast main line atColton, just north of Maryborough. Trains stopped at many stations along the line, but the main stations were Pialba and Urangan. 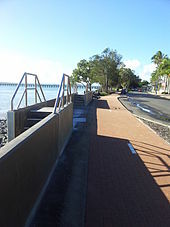 The railway then extended along the Urangan Pier. The line carried out pineapples and local goods from the city. The line was closed in 1993. The tracks from Nikenbah to Urangan were removed and the Pialba – Urangan line was converted into a mobility corridor. Traces of the railway line are still visible in Urangan. There are two semi-removed crossings (Everything but the tracks was removed) near the end of Pier Street and the track’s ballast is still slightly visible from where the mobility corridor ends.